This Carriage Print picture by Claude Buckle is perhaps the finest architectural drawing that Buckle made. 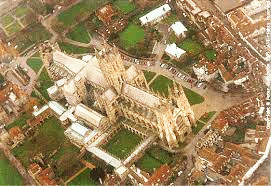 The picture, in water colour, shows Canterbury Cathedral from the north west. Henry Yevele’s enormous 80’ high nave of 1379-1405 and the central tower of 1490 are prominent. This is an unusual angle of view for the cathedral. 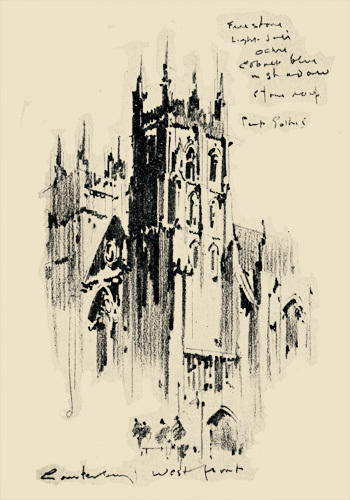 The pencil sketch shown left is of West Front (on the right of the main picture) and illustrates the typical sketches that Buckle would have made of the Cathedral. Arial View from the north west.